SHORT STAY Car Park (next to the fun park) Follow the A351 (Victoria Avenue) into Swanage almost to the end and turn right into Rempstone Road, take the next left (a small one way road) just before the pedestrian crossing into Station Place. The short stay car park will be at the end of the road in front of you. LONG STAY Car Park - Follow theA351 (Victoria Avenue) into Swanage, the car park is well sign posted as Main Beach Car Park and is on the right hand side. The Fun Park is a short walk from there as you head towards the main part of the sea front. WALKING from the train station - Walk down Station Road which is just the other side of the mini round-about. After a short walk turn left into Mermond Place (you will see a sign for the Jurasic Golf) from there walk up the steps that will lead you to Santa-Fe fun park. 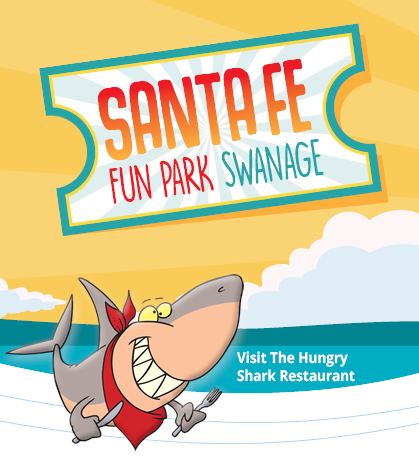 Santa Fe Fun Park - Mermond Place - Swanage - Dorset BH19 1DG. From - Easter through to the end of October! School Holidays - open from 10am to 10pm. Term Time - open from 10am to 6pm.